Kurious Kitty is taking a break, so the blog will be temporarily closed. Posts will be back beginning October 6th. After 2,011 posts, KK needs to regroup and stop repeating herself! You know you need new material when you've posted for a whole week about chickens, or restaurants, or dragons! Enjoy yourself while I'm gone and keep reading! Also, take a look at our new website, which I believe will be going live next week. Let us know if you think we've forgotten anything, or if you have difficulty finding what you need on the site. 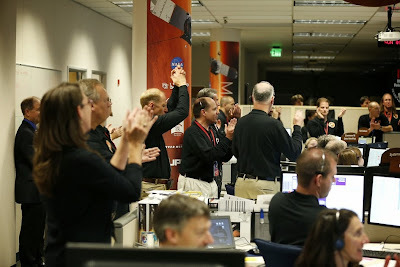 Celebration: MAVEN Arrives at Mars. 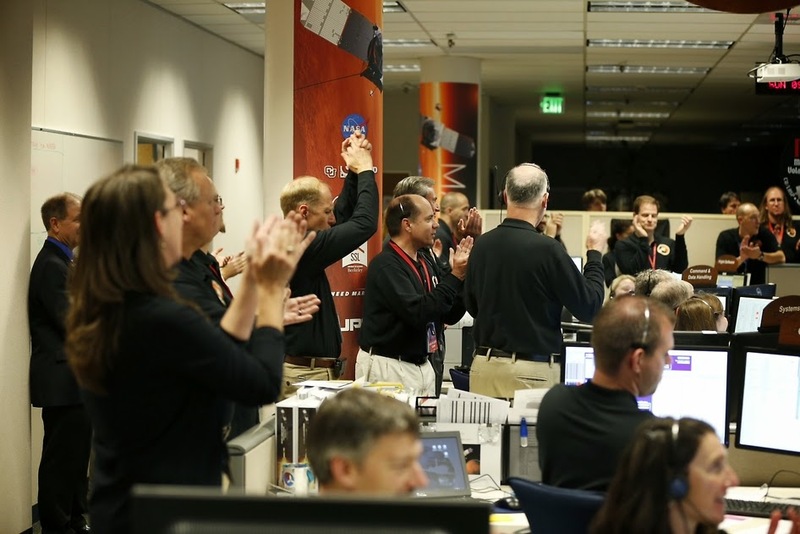 Members of the Mars Atmosphere and Volatile Evolution (MAVEN) team celebrate at the Lockheed Martin operations center in Littleton, Colorado, Sunday night, after getting confirmation that the spacecraft entered Mars' orbit. MAVEN is the first spacecraft dedicated to exploring the tenuous upper atmosphere of Mars, and will soon begin taking measurements of the composition, structure and escape of gases in Mars’ upper atmosphere and its interaction with the sun and solar wind. Credit: Lockheed Martin, courtesy NASA. After a decade's journey, the MAVEN project is embarking on a new phase. MAVEN has entered the gravitational pull of Mars and will be orbiting the planet. It probably won't be long before the little green men show up! Only kidding. The information gathered from the mission will increase our knowledge of our neighboring planet. However, this new knowledge will probably render all our materials on Mars obsolete, but until then you can brush up on what we currently know! 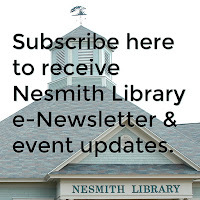 If you like museums, but don't get to travel far, the Library has passes to several museums within a 45 minute drive of Windham. Here's a list of the museums for which you can borrow reduced admission passes. 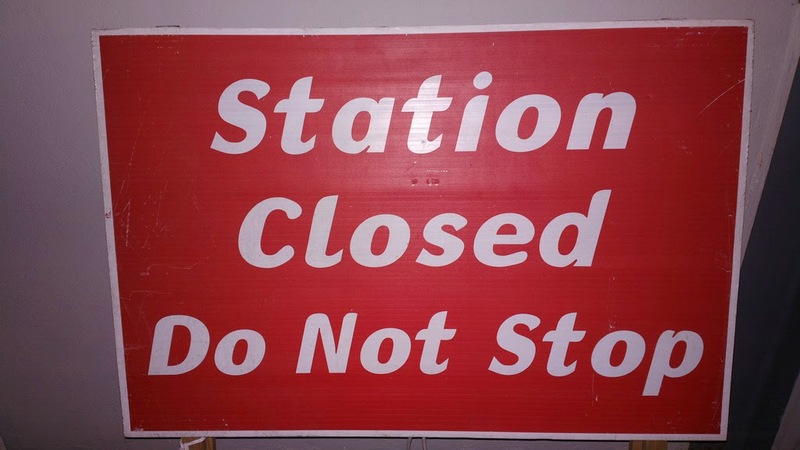 Now, let's say you don't even want to travel 45 minutes. Did you know that there is a website that hosts the Museum of Online Museums (MoOM)? By clicking on the links you can view the collections of museums in the U.S. or in locations around the world. How awesome is that? A Visual History of Whispering Imps on Magic Posters. A word of warning: some links are no longer active, but there are so many more that are! Today is the official international celebration known as Talk Like a Pirate Day! Are you wearing your peg leg and your eye patch and are you aaarr-ing and avast-ing? A pirate's best friend (and probably his only friend) is his parrot, so, in honor of piratical parrots everywhere, I'm sharing a poem by James Merrill, from Collected Poems [811 MER]. As you read it, imagine the old woman as an old lady pirate! 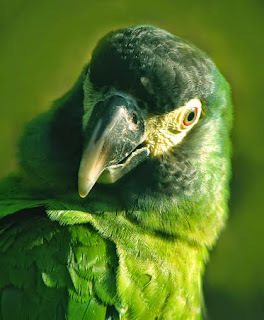 Sweet nothings to her parrot in its cage. Beyond what is serene or quaint. The individual face behind the mask. While knowing but a woman's face. To stillness in the bestial night. Admittedly, I have no idea what it all means, but I like the way it sounds! Shiver me timbers, it's now time to be heading over to The Poem Farm where Amy is holding the Round-Up. Photo by LHG Creative Photography. 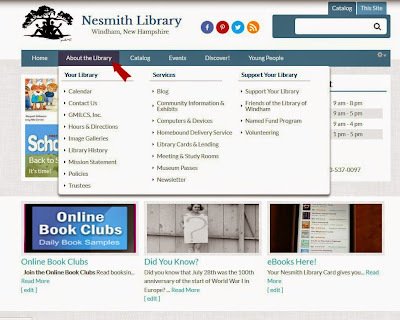 We are quite excited to be launching our new Nesmith Library website within the next week or two. 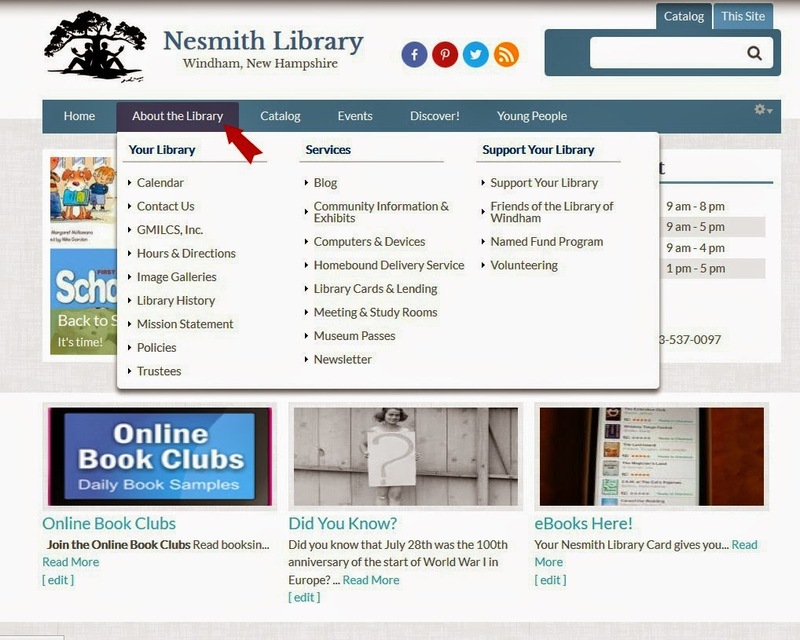 The web address will remain the same www.nesmithlibrary.org, but the design will be totally different and user-friendly. Kurious Kitty is going to offer you a sneak peek (click on the images to enlarge)! 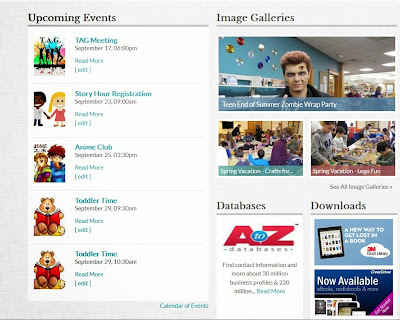 Right on the home page you will also find a list of events, as well as photos, clickable links to databases, and more! 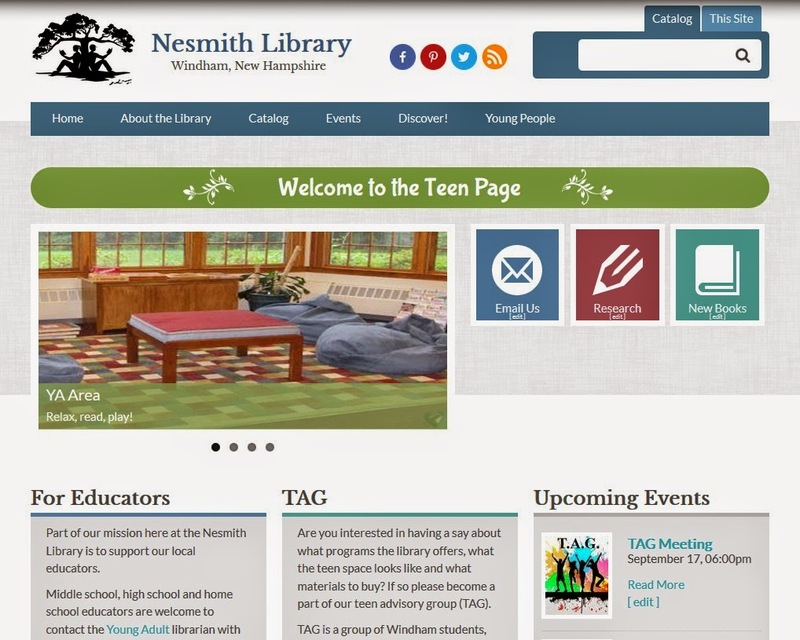 There will be a page for Kids (and their parents), and another for Teens. 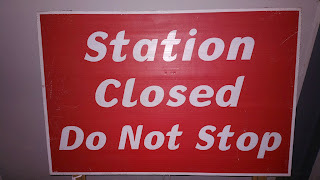 We are busily adding content, and proof reading, and making last minute changes, but it won't be long now! Avast! And all that! Get your do-rags and your eye patches ready for Friday when people all over the world celebrate "Talk Like a Pirate Day!" TLAPD has been celebrating those colorful rapscallions in lore (the real guys were just plain criminals) for a dozen years now. 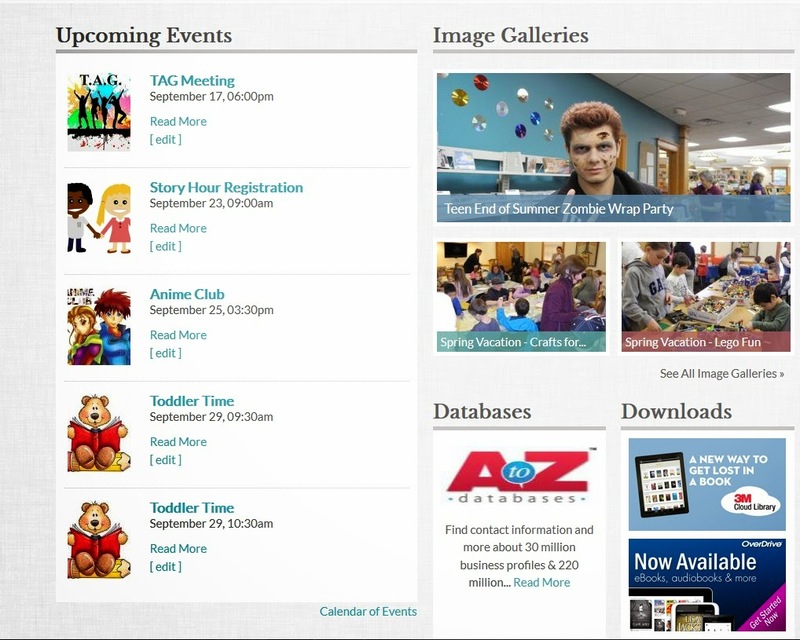 Check out the TLAPD website to learn more, to watch videos, and to brush up on your pirate lingo! Today's the day to make you mark on the world. 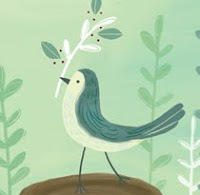 Draw or paint, write, or sing, or dance. Or do them all! Just do something creative and you'll be joining thousands of kids who are marking their marks too! The day was sparked by The Dot, a picture book by Peter Reynolds, and his follow-up book, Ish [both JP REY]. 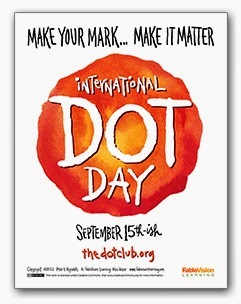 You can see dots created by children's book writers and illustrators at Celebri-dots. And here's an example of how some kids, on opposite sides of the globe made their mark last year! What great images! I can picture it all, can't you? Please stop by No Water River where Renee is hosting this week's Round-Up. If you have any doubts about reading nonfiction, take a look at the New York Times review of Elephant Company, written by novelist Sara Gruen. Over the past few weeks, I've seen article after article such as the one that was posted by The Washington Post on Monday, "Why kids should choose their own books to read in school" by Valerie Strauss. I hope the appearance of such articles signal the end of the "reading list." We've just completed three months of summer reading in which students had to read from an assigned list. Let's just say, on some of the lists I had a hard time finding a title I would have picked up and read! A little guidance and reader's advisory is good, reading lists, maybe not so much. Let the children read! You'd be surprised how a child who has read a book, liked it and recommended it to his/her classmates, can start a run on a book! Block, Lawrence. A Walk Among the Tombstones. [F BLO, also LP BLO] Opens 9/19 with Liam Neeson. Dashner, James. The Maze Runner. [YA DAS, also 3M ebook] Opens 9/19. Flynn, Gillian. Gone Girl. [F FLY, also 3M ebook, AB/CD FLY. And, if you read Chinese, we have it in Chinese, too! CHINESE F FLY] Opens 10/3 with Ben Affleck and Rosamund Pike. King, Stephen. "A Good Marriage" in Full Dark, No Stars [F KIN, also LP KIN and AB/CD KIN] Opens 10/4. Lelord, François. Hector and the Search for Happiness. [LP LEL] Opens 9/19 and stars Simon Pegg. Trooper, Jonathan. This Is Where I Leave You. [F TRO, also 3M ebook] Opens 9/19 starring Jason Bateman. Next Friday the newest film based on one is Dennis Lehane's stories is being released. The film is titled, The Drop. The movie tie-in book is titled The Drop [F LEH], however, the original short story upon which the screenplay is based is "Animal Rescue." The story appears in Boston Noir [SC BOS], a collection of stories edited by Lehane. "Animal Rescue" was also written by Lehane. Other writers whose stories appear in Boston Noir are Stewart O'Nan, John Dufresne, Brendan Dubois, and Lynn Heitman. Lehane also wrote the screenplay for The Drop. Confused? I'll bet! We've received the novelization based upon the movie based the short story and it is already checked out, so, you'll have to put your name on the holds list if you want to read it before you see the movie. Or, you can read the short story, because last I looked, Boston Noir was sitting on the shelf! 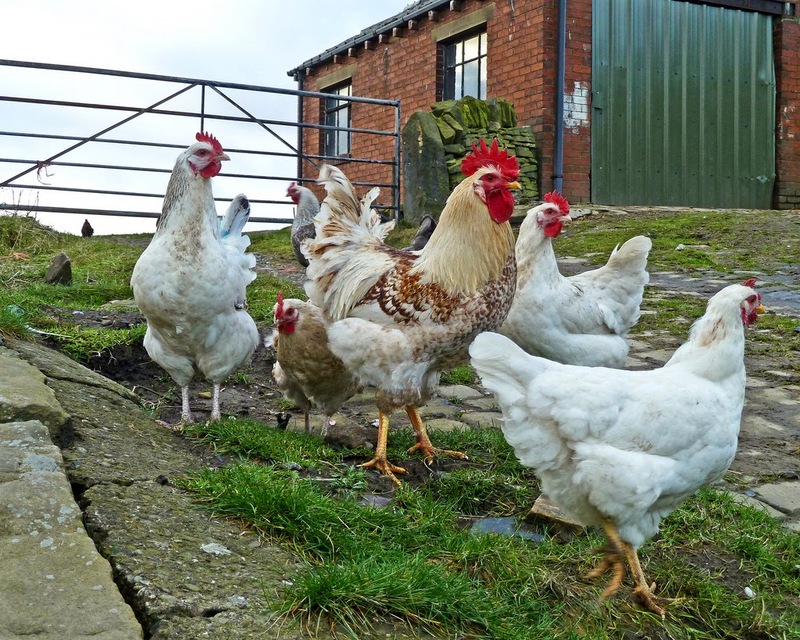 Over the entire globe, human communities in a wide variety of environments tested, molded, and perfected thousands of breeds of chickens, goats, sheep, cattle, horses, and other traditional farm animals. 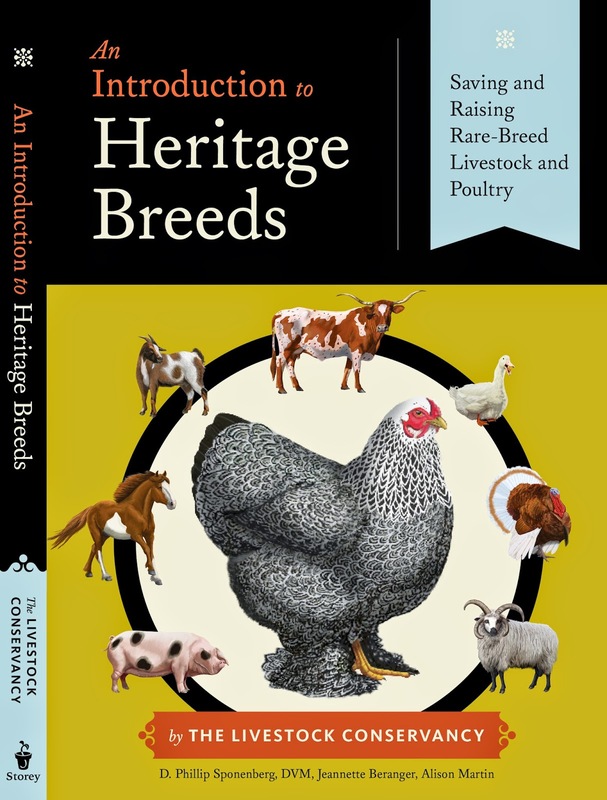 This long history of partnership between animals and people often goes even deeper: many heritage breed also reflect the cultural approaches to survival of various ethnic groups, specifically the different ways in which each group adapted to and used its environment. 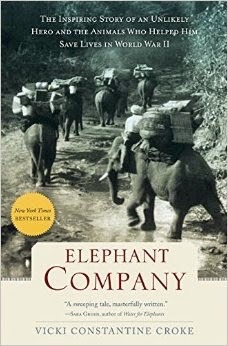 This passage puts the raising of animals into a cultural context that is both fascinating, and important to remember as we think about the future. You can learn more on The Livestock Conservancy's website. 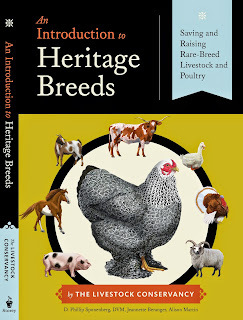 I love the colorful names of some of the heritage chicken breeds: Buckeye, Buttercup, Cubalaya, Dorking, Java, New Hampshire, Redcap, Shamo, Yokohama. If you want to try your hand, you can start by reading, and then moving on to the building of a shelter and providing for the animals. Manuals such as Storey's Guide to Raising Chickens: Care, Feeding, Facilities by Gail Damerow [636.5 DAM] can be found on our nonfiction shelves. 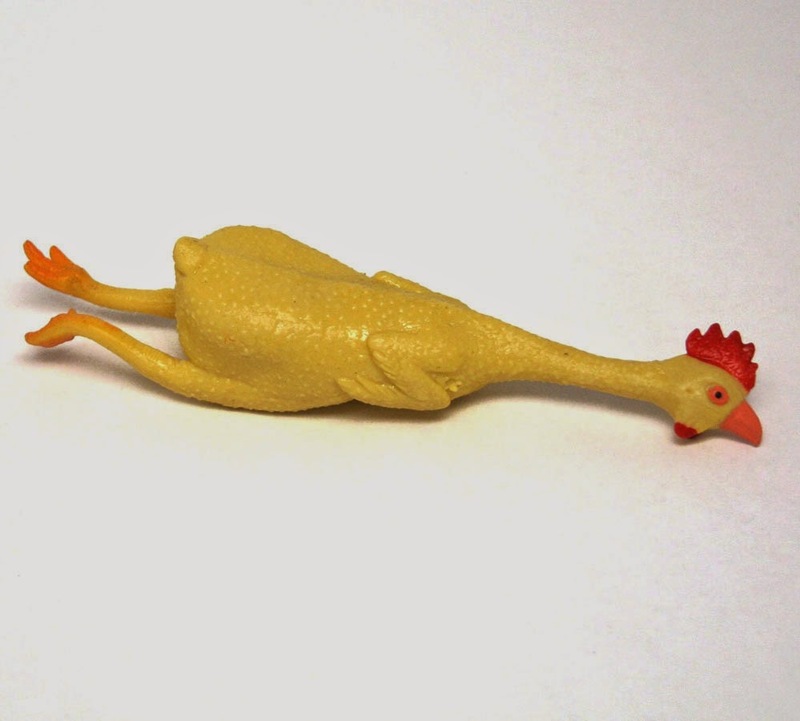 The chicken as a character appears frequently in children's books, because, like the proverbial rubber chicken--it is just so darn funny! What? You haven’t been patiently anticipating National Chicken Month? What’s wrong with you? I’ll bet it’s because you celebrate all year long! Who doesn’t like a good chicken dinner? Or a delicious three egg omelet? National Chicken Month is sponsored by the National Chicken Council, which has chicken recipes galore. 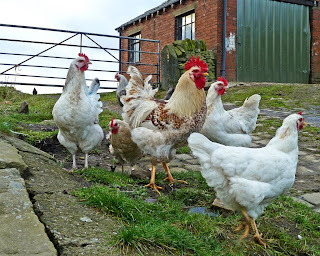 Visit their Eat Chicken page for a searchable database of recipes. However, the Eat Chicken page does not have egg recipes. For those you have to visit the American Egg Board’s Incredible page. The Library is closed today to celebrate the Labor Day holiday. In our area, the northeast, labor history is marked by the textile mills that sprang up in the 1800s and operated for about 100 years before most were closed down. Textile workers, both native born and immigrant worked long and hard. Today is a day to honor their labor, and to be thankful that labor organizers brought health, safety, and human rights issues to the forefront, which resulted in laws that improved the lives of all Americans. See you tomorrow at 9 AM.